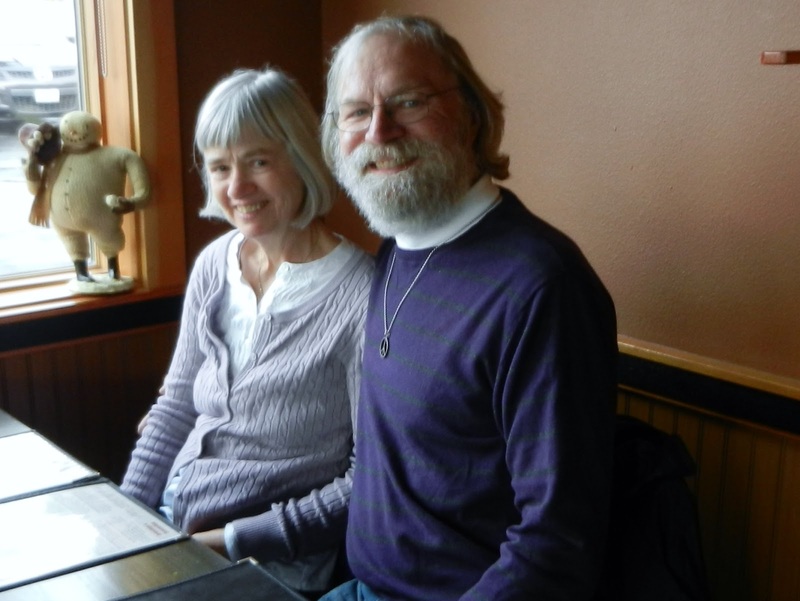 Charlie and Rachel Stark (of Northfield, MN) enjoying lunch in Everett, WA with Karl and Sue Tegland. Charlie reports that he retired earlier in 2012, but got restless. He is now selling solar panels for an up-and-coming company in Northfield and is very enthusiastic about his new gig. Below are hosts Karl and Sue, pictured earlier on Christmas Day in their home on Silver Lake, in Everett, WA. Please help update the class mail directory by sending information to JeffHi1965@gmail.com. Kaleen Anderson Hilsenhoff is maintaining the database for us. Please assist her in anyway you can to make this as accurate as possible. Send your email address, street mailing address, phone number and, just for fun, your birthdate. (We already know your age.) Please find and encourage "lightfaced" classmates to submit their info as well...or just do it for them as a friend. We do not post addresses on-line and we'll only use them to aid in class-related activity. Lightface -- Current info needed, please send it to JeffHi1965@gmail.com. Boldface -- Please be sure we have your current information to make directory as complete as possible. Bold Italic -- Deceased - Never forgotten. Larry Sass, Jeri Salt Hillemeier, Karen Schjei Benson, Janice Schlosser, Gregory N. Schmidt, Patricia Schmidt, Mary Jane Schoeneck Lenarz, Robert Schorn, James Schrupp, Gary Schulke, Barbara Schultz Huelsman, Kathy Schultz Hagemeister, Marie Schultz Daugherty, Michael Schultz, Bonita Schwanke Meyer, Janet Schwegler Barcus, John E. Seim, Judy Seppanen Davis, David Serie, Gary Severson, Sharon Severson, Bonnie Seward, Kathy Sherry Skadsberg, Mary Jo Simenson Benson, Joan Skoglund Miller, Sara Smith Sevey, Kay Spaulding Block, Lynne Spellman Lommen, Gloria Springer, Charlie Stark, Richard Steinmetz, Robert Steinmetz, Sharon Stoltenberg, Paul Strandberg, Karl Tegland, Tom Tessmer, Eugene Thomas, Patricia Thompson, Lonnie Thornton, Tom Toenjes, Barbara Toon, Donovan J. Trousil, Marlene Trousil Dynda, Bernice Tvrdik Trousil, Duane Tvrdik, Nancy Unger, Ellen Van Kempen, Barb Vendel Floding, Gerald Vogt, Connie Volden Larson, Teresa Wadsworth Widstrom, Diane Walker, Elaine Walstad Mounsdon, Robert Watson, Peggy Watters, Patricia Wheeland, Colleen Whelan, Paula Widstrom Hanson, Donald Wilke, Darrell Williams, Frances Wolters Engleby, James Wussow, James Yager, Patricia Ziebarth Kolodjeski, Marlene Zimmel Bettin.